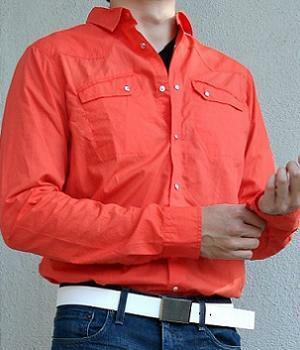 This orange cotton shirt has snap button closure on the front and two snap button chest pockets. One special thing about it is that it has sew-through button collar. I like the snap buttons because they make doing and undoing buttons easy. 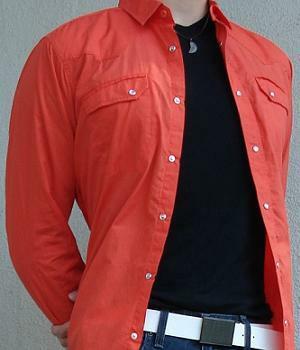 Overall this shirt has minimal design but its snappy color makes it a necessity in every guy's wardrobe! You don't want to always wear black & white do you? While shopping at Nordstrom Rack for the first time I was leafing through articles of men's clothing and this orange cotton dress shirt came into the view. Its bright orange color stood out and I had to try it on. I had a white t-shirt on underneath and they weren't as good a match as I'd hope, but somehow I felt it'd go with black very well. Also I like its simplistic design and narrow waist, so I got it. 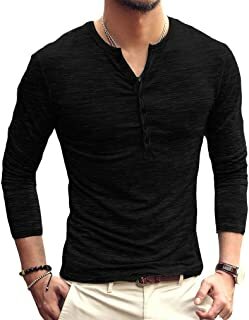 This high quality shirt feels soft and comfortable. It is thick and does its share of keeping me warm. It's made of 100% cotton. 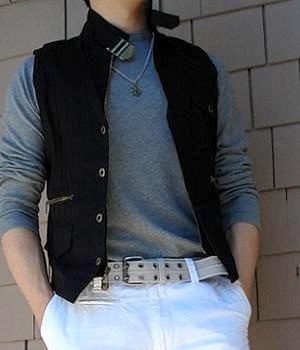 It looks great with black t-shirt underneath and a pair of dark blue jeans or true white pants. 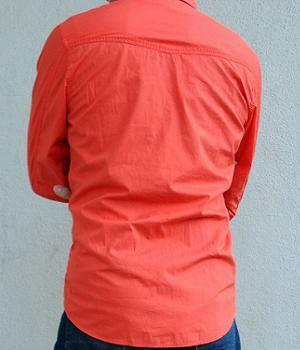 BUY this dark orange shirt NOW b4 they run out!